Qom007.site is the PUP that uses misleading techniques to prevent removal. Use Reimage to locate malicious components and get rid of them faster than with uninstall instructions. A full system scan blocks virus reappearance and prevents traffic to malicious domains. Qom007.site is a malicious domain which displays fake alerts and tries to pursue users to download a bogus anti-virus program or fake update. The truth is that users’ computers are not damaged, and the alarm caused by this site is just a scam. Continuous redirects to Qom007.site mean that you have adware program installed which invaded your machine without your permission. These troublesome intruders often sneak into the system with bundling – a deceptive marketing technique used by free software developers to infect systems without their owners' approval. Your Windows Computer is Infected With (3) Viruses!Your device is infected with (3) Viruses. The pre-scan found possible of (4) malware and (3) phishing/spyware. Your system is at risk of irreversible damage – Immediate removal advised!Scanning and cleaning is advised to prevent further system damage, loss of personal data, photos and passwords. As you can see, cybercriminals are using malicious social engineering to scare users into thinking that their PC is in danger. Besides, they also warn their victim about personal information and promise that it might be compromised. Indeed, such alerts can be horrifying to hear, especially if you are inexperienced PC user who has never encountered something similar before. However, security experts can assure you that this type of message is fake and your bank account is fine. To get rid of redirects to this and similar scam sites, you should remove Qom007.site virus from your computer. Whatever you do, do not click on any links displayed by such scams. Before you do something, check the address bar and look for suspicious signs – like typos or grammar errors. Fake alerts are relatively easy to recognize as long as you do not panic, stay calm and pay attention to every detail. Your machine might become incredibly slow as multiple processes can start running in system's background, etc. There is no doubt that unwanted programs can bring numerous negative effects to your computer. Hence, do not delay Qom007.site removal. The easiest way to delete the virus is to employ one of anti-malware tools that are provided below. You can use Reimage or any other legitimate software. Security expert recommend avoiding Qom007.site virus as it shows fake alerts that promote malware. Many internet surfers are not that great when it comes to computers and technology. Therefore, adware and PUP creators try to abuse this fact and bundle their shady apps within free software installation packs. Fortunately, avoiding unwanted applications on your computer is not that hard. All you have to do is being extremely attentive while installing freeware. Beware of any additional components that might be pre-checked within the Advanced installation mode. Therefore, avoid Recommended settings entirely and read through installation instructions thoroughly. 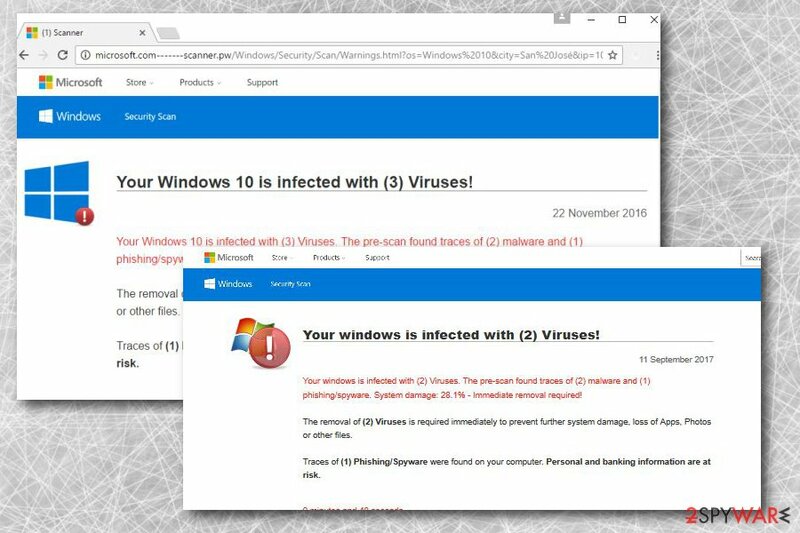 As we already mentioned, avoiding scams such as “Your Windows Computer is Infected With (3) Viruses!” is relatively easy once you get a grip on how they work. For example, if the message would be legitimate and come from Microsoft, the address bar would display www.microsoft.com and not some shady never-seen address. So, it is all about being careful and vigilant – do not let crooks trick you. You can remove Qom007.site virus by checking our guide below this article. We made every effort to make it as clear as possible – so please follow each step carefully. Without the correct execution, you risk to put your computer at risk of being infected once more. To prevent this, we highly recommend following every step in exact order. However, if you are not that computer-savvy individual, you should proceed with automatic Qom007.site removal. To achieve that, you merely have to download one of the anti-malware tools given below. Next, simply install the program and perform a full computer scan. The final task you will have to do is to remove malicious components detected by the program for you. To get rid of Qom007.site virus from Windows OS, you need to remove suspicious elements via Control Panel. For that use the following guide. Here, look for Qom007.site or any other recently installed suspicious programs. Wait until you see Applications folder and look for Qom007.site or any other suspicious programs on it. Now right click on every of such entries and select Move to Trash. When in the new window, check Delete personal settings and select Reset again to complete Qom007.site removal. Once these steps are finished, Qom007.site should be removed from your Microsoft Edge browser. Here, select Qom007.site and other questionable plugins. Click Remove to delete these entries. Now you will see Reset Firefox to its default state message with Reset Firefox button. Click this button for several times and complete Qom007.site removal. Here, select Qom007.site and other malicious plugins and select trash icon to delete these entries. Click Reset to confirm this action and complete Qom007.site removal. Here, select Extensions and look for Qom007.site or other suspicious entries. Click on the Uninstall button to get rid each of them. Now you will see a detailed dialog window filled with reset options. All of those options are usually checked, but you can specify which of them you want to reset. Click the Reset button to complete Qom007.site removal process. ^ Scam Alerts. What to do and know about scams in the news. The Federal Trade Commission (FTC) - Nation’s consumer protection agency. ^ Security website. Bedynet.ru. Russian security site. ^ Fraudulent Email & Websites. Trust Center - Source for latest security & system performance information. This entry was posted on 2018-02-07 at 08:36 and is filed under Adware, Viruses. You can quickly scan the QR code with your mobile device and have Qom007.site manual removal instructions right in your pocket. How did you remove Qom007.site?